I have been really lazy busy lately so I will try to make up for it today. 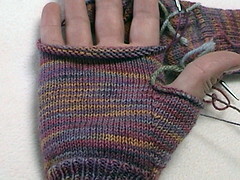 I have gotten to the fingers on my Hooray for me gloves and stopped. Don’t know why. Just did. I think I have a massive fear of new things. 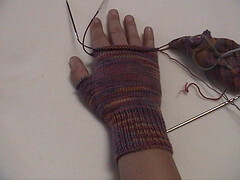 I have never done fingers on gloves before. Just thumbs on mittens. I know there isn’t much difference but I just seem to have hit a wall with them. 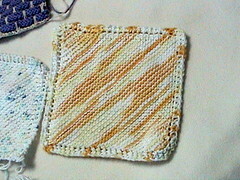 I really am in love with these so I am hoping to get my nerve up soon so I can finish them. The colors (LL Motherlode) are absolutely gorgeous. And they feel so good on my hands. Lorna’s Laces rock I swear it!!! I was kinda scared of the gold mixed with the pinks and purples. Not a big gold fan here. But it is really working out great. Now for my project that is in a massive time out!!!! 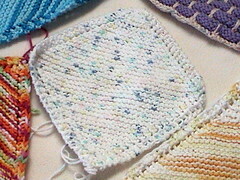 I sent these suckers back to there corner after frogging the first heel!!!!!! 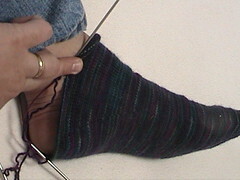 Yup I frogged the damned heel. 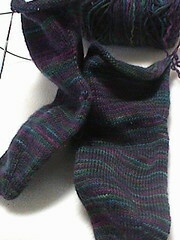 Turns out that I had made the foot too long and started my gussets too late. Which resulted in a heel that looked like an elf’s shoe on my foot backwards! I forgot to take a picture cause I was so flamin’ mad. 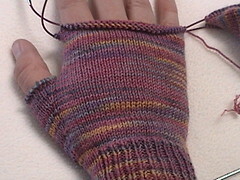 But here they are frogged back to the end of the gussets. 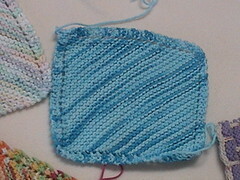 I still have to frog the gussets and a little bit of the foot. But for now they can sit until I can cool off about the whole mess! See how they are bunched up around the top of my foot? That’s cause I didn’t have them stretched out over my foot completly. Something about holding a camera and stretching a sock all while fending off 2 camera hogging toddlers. 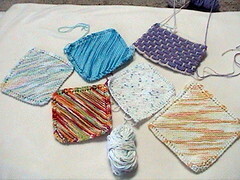 After I got scared of the fingers and pissed at my heel, I went on a dishcloth spree. Here are just a few pics for you to check out. 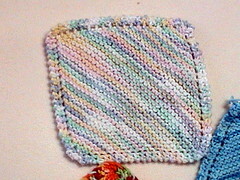 This is my very first ball band dishcloth. It is not as fun as I expected it to be. I have heard so many great things about them so I decided to give it a shot. 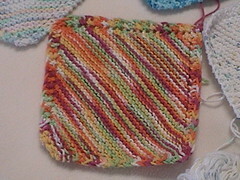 I am happy with the way it is turning out but just don’t enjoy the process for some odd reason. It’s not hard or anything. Just boring to me. Which is kind of funny considering that I absolutely love the mindlessness of Granny’s favorite. Can’t you tell? 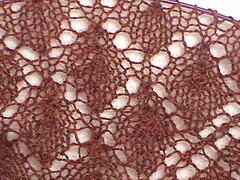 I ended up frogging the whole 10 rows and decided to use the yarn for a different shawl(Fir cone square shawl from Folk Shawls). 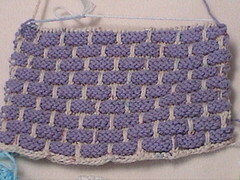 Did a swatch and didn’t like it one bit. I want a different color I think. 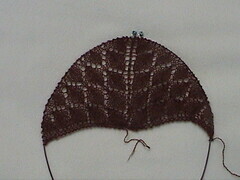 My friend Tammy started on her Forest canopy in some really beautiful colors and it made me want to try again.